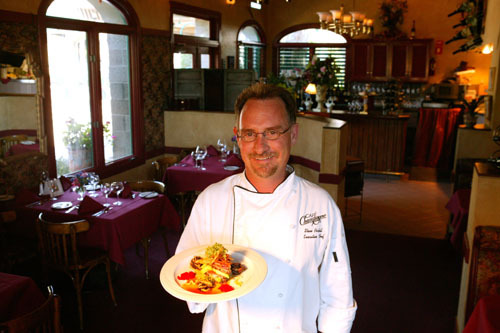 Cafe Champagne, Winner 5 stars for its California Cuisine and the Golden Bacchus awarded for the wine list from the Southern California Restaurant Writers. The only Restaurant in the Inland Empire awarded the Golden Bacchus. The award-winning, Café Champagne at THORNTON WINERY is a "want to do" for every visitor to the Temecula Valley. Since 1988, from growing herbs to cutting home-grown flowers, every effort has been made to offer the perfect combination of French Country Elegance and Gold Medal-winning Contemporary Cuisine. THORNTON WINERY, family-owned by John, Sally, and President Steve Thornton, is proud of its award-winning food and wine. 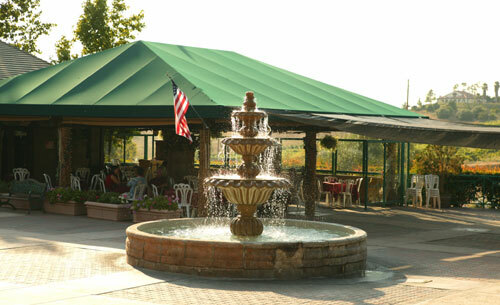 THORNTON WINERY and Café Champagne provide a breathtaking entrance to the Temecula Valley Wine Country. Country French elegance combines with "Contemporary Fusion Cuisine" to create a well-rounded flair for the total gourmet experience. Café Champagne with their dedicated staff's expertise and artfully designed menu, has won the Gold Award for Contemporary Cuisine for eleven consecutive years from the Southern California Restaurant Writers Association. "Four Stars for Cuisine" and "Four Stars for the Wine List" were awarded by the California Restaurant Writers Association. Copyright © 2010 Thornton Winery, Inc.